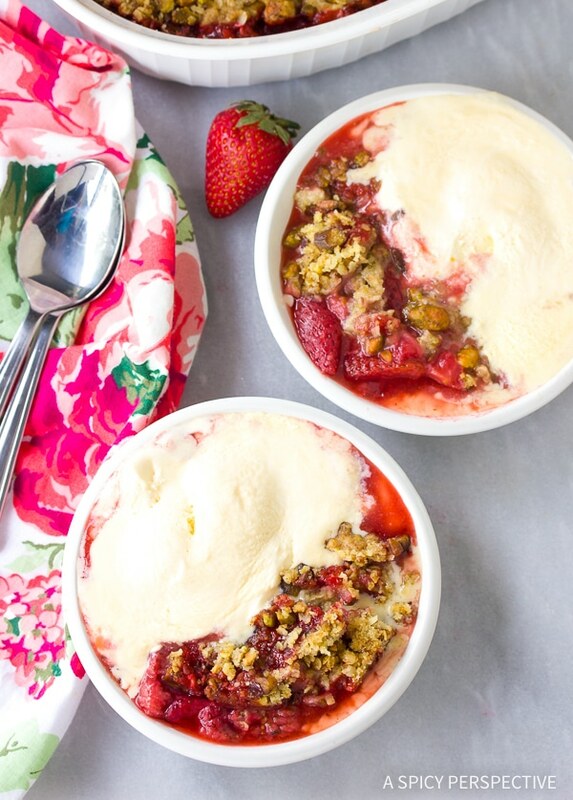 Our bright blushing Fresh Strawberry Pistachio Crumble is the perfect summertime treat! When you’re out in the berry patch, drinking in the sunshine, tasting warm strawberries straight off the vine with sweet juice dripping down your chin… You don’t think about the size of your refrigerator. This happens to me several times a year. We go to the farm and come home with way more berries than we could possibly use in one week. So what do you do with five gallons on strawberries? First I separated them into three piles: super-ripe bake now or freeze, ripe use within the next couple days, almost-ripe use within a week. I put most of the super-ripe strawberries in the freezer for smoothies and post-season baking. Then I used some of the super-ripe strawberries for Strawberry Basil Italian Ice to keep in the freezer for late night sugar cravings. The next day I put the ripe berries and some of the slightly under ripe strawberries in spicy Strawberry Chipotle Jam. And finally I make a lovely Fresh Strawberry Pistachio Crumble for my family to enjoy after dinner. What’s the Difference Between A Cobbler, Crumble and Crisp? There are many varieties of baked fruit desserts. Most of them, at one point or another, have been mistaken for “cobbler.” Variations and names tend to be regional. If you like to bake, it’s worth getting familiar with them. Cobbler – Baked fruit with a rolled crust made of pie crust, cookie dough, or biscuit dough. Sometimes the biscuit dough is spooned over the top, instead of rolled, but it’s always a thick topping. Buckle – Fruit with cake batter poured over the top before baking. Crisp – Baked Fruit topped with a “rubbed” crumb top usually consisting of butter, sugar, and flour. Crumble – Similar to a crisp with the addition of oats. Grunt/Slump – Baked Fruit topped with biscuit dough, that is then covered so that the biscuit steams instead of bakes. Brown Betty – Baked fruit topped with buttered bread or cake that has been crumbled. Today I’m serving you a crumble, named for it’s crumbled oat top. 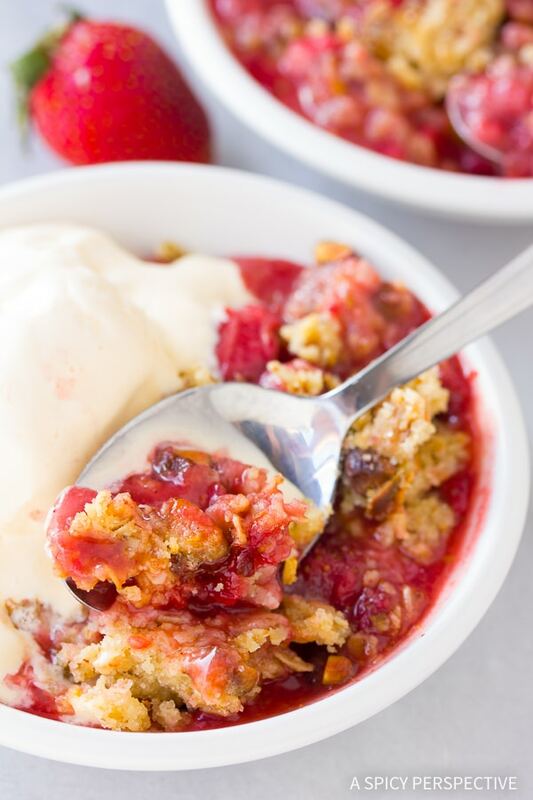 I personally prefer crumbles to most other types of “cobbler” because of its texture and the way the topping breaks apart when you spoon it out into bowls. 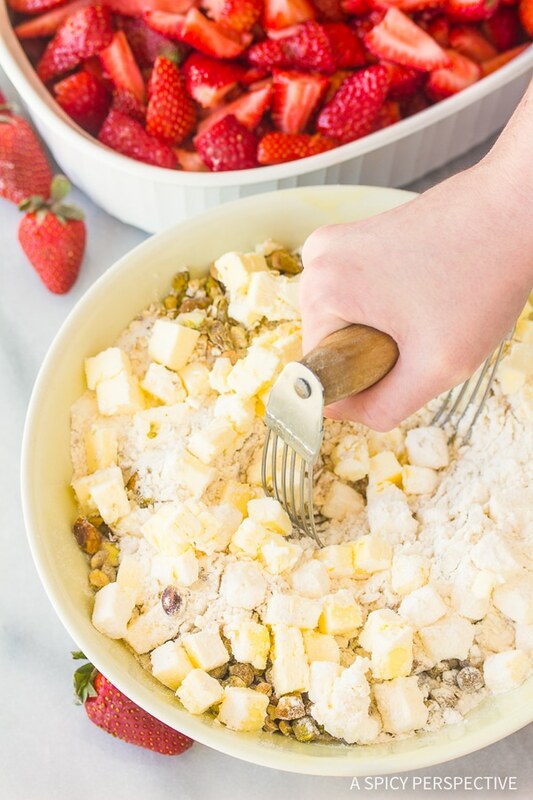 For this Strawberry Pistachio Crumble Recipe, I’ve simply combined fresh cut strawberries with a little lemon, sugar, cornstarch for thickening, and a touch of Chambord. I’ve been using quite a bit of Chambord lately because I have in nice sized bottle of it and find it adds such depth to everything it graces. In this dish, the Chambord doesn’t cover, but accentuates the strawberries. I’ve made this same crumble with Bourbon as well. It was just as lovely, but the Chambord does have a way of drawing the berrieness out of the strawberries. For the top I’ve combined a simple oat, flour and butter mixture with chopped roasted pistachios. The salty nutty essence of the pistachios is a great way to balance out the acidity of the strawberry filling. Crumble: hot or cold? Although its tempting to eat a crumble right out of the oven, I don’t advise it. The sauce needs time to cool and thicken so it holds together. Plus, in my opinion, hot berries taste overly acidic. I like to eat baked fruit desserts at room temperature. The flavors of the strawberries, Chambord and pistachios really shine, when it’s not too hot or too cold. 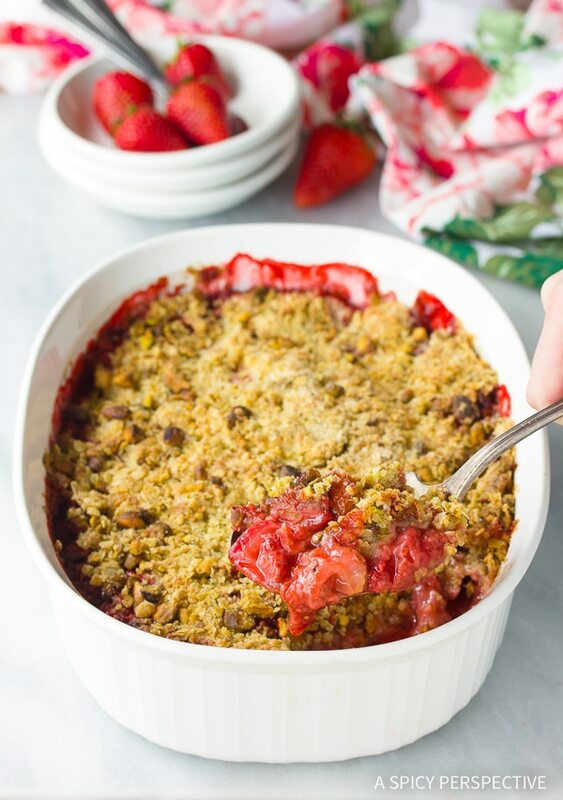 Fresh Strawberry Pistachio Crumble is best with fresh summer berries, but you can make it with frozen strawberries all year long! 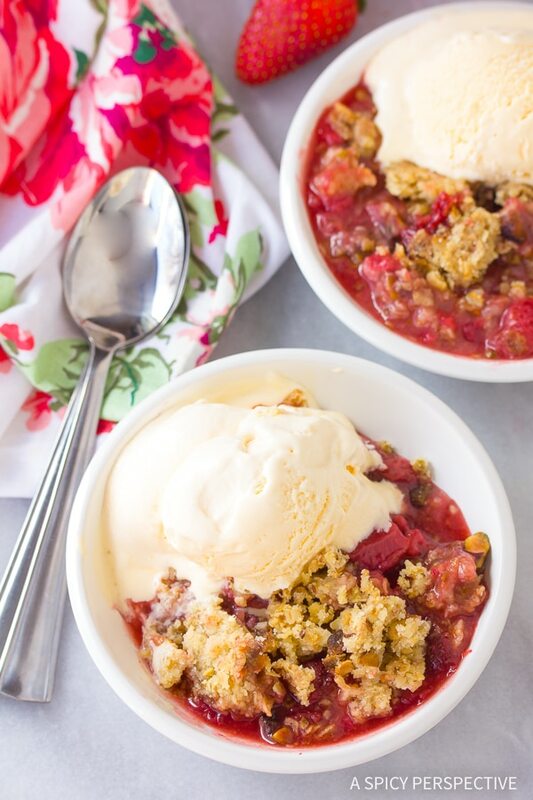 This bright blushing Fresh Strawberry Pistachio Crumble is the perfect summertime treat! 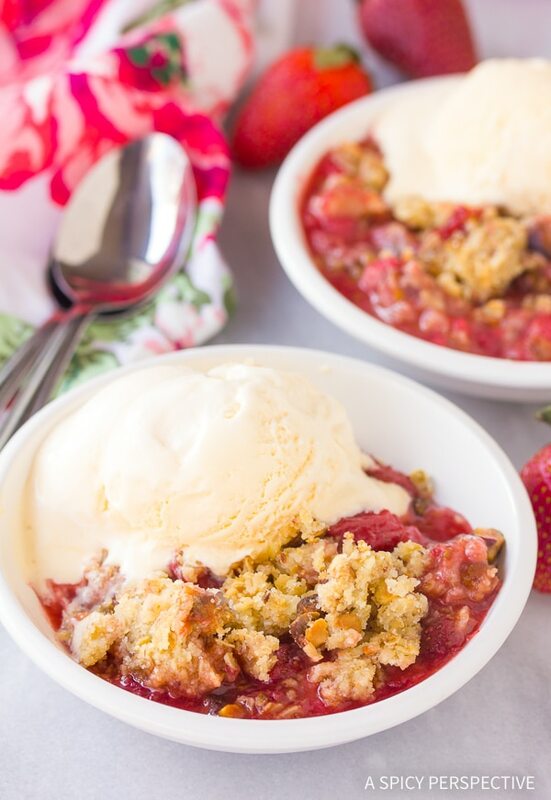 It's an easy cobbler variation with a irresistible crumb topping! Preheat the oven to 350 degrees F. In a 9x13-inch baking dish, mix the strawberries with the following five ingredients. Spread the berries out evenly. Using a dough blending tool (or your hands) mix the ingredients for the topping until the butter is well combined, but the mixture is still crumbly. Spoon the topping over the fruit. Bake for 40-50 minutes, until the edges are bubbling and the top is golden. Allow plenty of time for the crumble to cool before serving. This looks and sounds amazing. But would you suggest something else besides Chambord ? Crisps, crumbles, cobblers ~ love them all. The pistachios are a great idea! 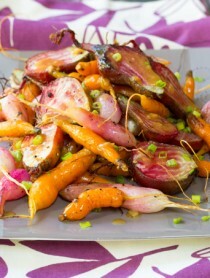 Looks lovely and what a great idea to include pistachios. Yumm! You’ve seen this before, yeah? Chambord, strawberries and pistachios- super combo. Wish I had been there for the strawberry fest, but I am happy just to get this recipe! I’m having breakfast while reading this post…Can you ship a bowl??? When I saw the title of this post…I knew I would fall in love. These flavors sound amazing together! Thank you for sharing such a beautiful recipe with me. I hope you have a wonderful day tomorrow. You and your sweet blog always makes me smile. This is hands down my fav recipe and post I’ve seen ever. Pistachios and strawberry’s?!! Genious! I am so jealous…. I mean happy for you that you have the opportunity to go strawberry picking and come home w more than you know what to do with. I’d be in heaven. I don’t think there are any strawberry patches here in Phoenix, but I’ll have to look into it just in case! Very,very nice tips on how to use up those blesseed berries. I am going to have to check into that Italian ice recipe too. this sounds so gooood!! love anything crumble and with a killer combo like this, who could resist? I made the crumble today, it is so yummy. Thanks for the suggestion and so easy to make. I like the sounds of this dessert… I know I’ve probably asked this before, but do you deliver? Have a great weekend! I love any kind of cobbler/crumble/slump. As long as it has hot fruit and a topping – I’m good. Particularly like your use of pistachios! Very creative. Wow I’ve never tried steamed biscuit before! That sounds amazing! Pistachios don’t get enough use in my house. That may be because my sons devour them as soon as the nuts come in the house. I love the idea of putting them in a strawberry dessert. Who did you use to help you set up this new site? I am looking for help with my wordpress move. Oh, thanks for the vocab lesson! I totally never knew the difference between all of these terms! This crumble looks super tasty! I remember you loving the strawberry pie but hating the goo. Perfect solution. Yum! I like the addition of pistachios here. I’ve got so many strawberries right now, would love to make this! Pistachios and strawberries must make a great combination! Strawberries are my favorite so I will be giving this a try. Also loved the definitions I had no idea and I’m sure I’ve been using them all wrong! This looks amazing! I love a good crumble, then you add the booze – sooooo good! Would you believe I have everything except the strawberries. They come in early July. This is a celebration post of the most wonderful berry! I like the pistachios in your crumble and I have to get a large bottle of Chambord myself! oh, why, oh why didn’t I get on the computer quicker today? A neighbor gifted me with strawberries just this morn, but I immediately mashed them up for ice cream. Your crumble sounds like a better idea. love that you used chambord in it. Will def have to try this. thanks, Spicy! I’d love to be faced with having way too many strawberries! I like how you very smartly dealt with that and this crumble is amazing! Love the combination of pistachios and strawberries. Nice pairing of strawberries and pistachios! You are making me crave for one of these baked fruit desserts. I love pistachios. I love strawberries. Put them together <3 !!! Fabulous as usual Sommer!! Oh, wow! Speechless! I could go for these. Love the strawberries and pistachio combo! We are making great use of our strawberries! This looks just fantastic. I cannot wait to try this out. Looks delicious! 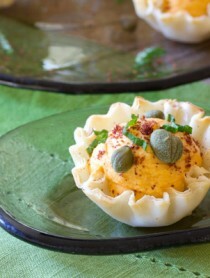 I love pistachios…they look terrific in this dish. Beautiful! I love cobblers and bet this is great. You’ve got me thinking about Chambord and may add it to my pie this weekend. Does it thicken at all and evaporate? Just wondering about adjusting the thickening ingredients. Gallons of berries – awesome! Yum! That sounds absolutely delicious. 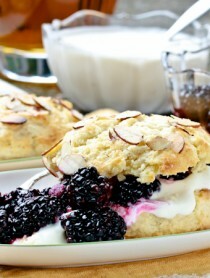 And what a great way to use some spring.summer fruit! Wow, I didn’t know that there are so many different names for baked fruit! I can say that I do love them all though. This crumble looks amazing. Strawberries are one of my favorite fruits and pistachios are hands down my favorite nut. This sounds and looks amazing! Lucky you to have access to a berry patch! We are seeing all kinds of lovely strawberries here now though so it would be great to make something like this. I love the addition of pistachio too! This is heavenly looking. I love the vibrant red color and the incorporation of the pistachios into the crumble. Definitely will be bookmarking this! Ok, so first I saw this, but as I was pressing “keep reading” my eyes had already strayed to the strawberry chipotle jam. Last week, I made strawberry-rhubarb muffins and yesterday, strawberry pancakes. Do I strawberry fever?? Should I get treated?! Thanks for more great ideas. How unique to put pistachios in the crumble–looks delicious! i’ve been obsessed with strawberries lately too on my blog! hahahaha. this is beautiful and scrumptious at the same time.never thought about combing them with pistachio! it’s a nut that i have yet to bake with! this looks gorgeous…and love the helping hand! too cute! Oh, WOW! I’m anxiously waiting the Indiana strawberries to ripen…I think they need some sun…not rain!!! 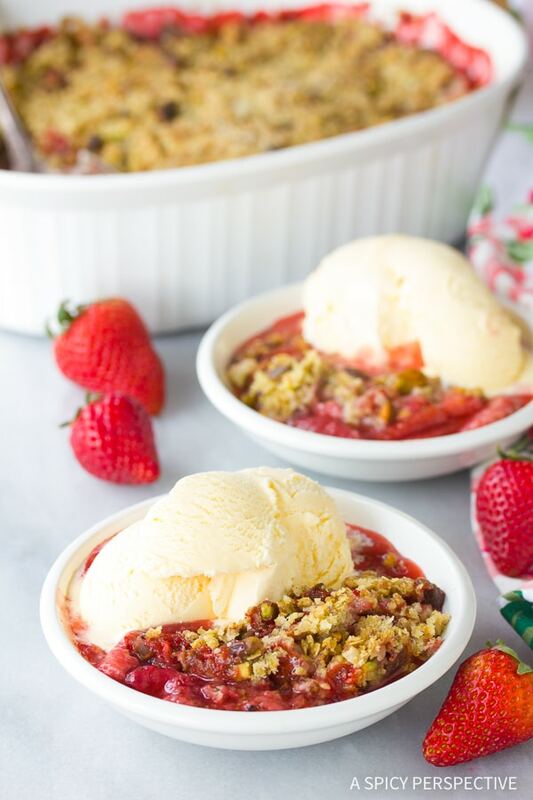 What a fabulous crumble…I have never made a cooked strawberry dessert, but after viewing your photos, I think this is the year! Beautiful, Sommer! Loved reading the different definitions,Found that very interesting. This is a beautiful crumble and I will bookmark it! That look delicious! I made one a few days ago, it was really good, it was different to yours, i have to try it! That is one stunning crumble! 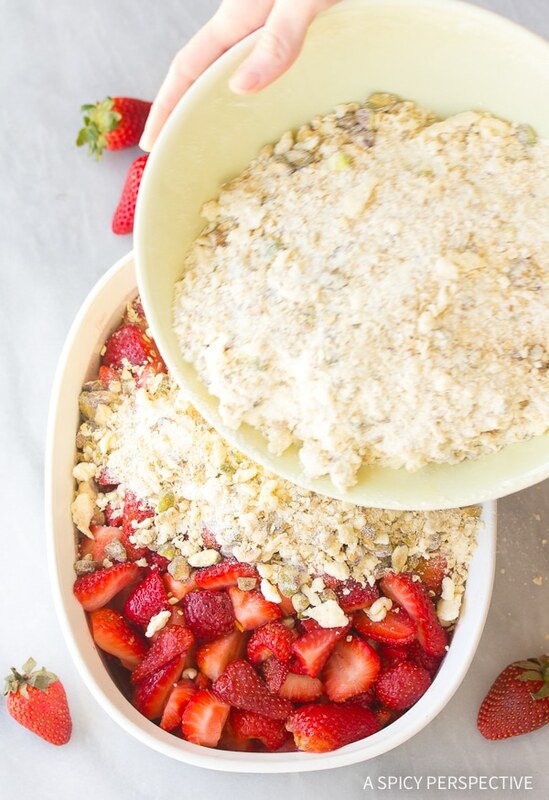 I just might buy some strawberries on my way home to make this oveer the weekend..
I’m a crisp or crumble kind of girl myself, I love the texture of the topping. I only wish I had your excess strawberry problem! I LOVE STRAWBERRIES! I can’t wait to try this recipe! Fresh vibrant red strawberries and earthy pistachio, two reasons why it’s nice to live on earth. That must have taste and smell soooo good! OH darn gosh.. it’s all about the crumble, at least for me.. I’m a crust, crumble girl.. heck I’ll even skip an entire muffin and only eat the crumble on top… but now that you are talking pistachios.. heck I think I’d dive right in to the entire dish! What a great crumble recipe! Beautiful pairing of pistachios and strawberries. What do you do with five gallons of leftover strawberries? Put them in a box and Fedex it to Mark&[email protected], Malaysia. We’ll trade you five gallons of fresh rambutan and nutmeg. Cobblers are truly special desserts, so simple and delicious. This one is temptingly beautiful, Sommer! I love me some boozy desserts!! Especially when that dessert is made with strawberries! So funny! I do just the same thing! We pick WAY too many strawberries and can never find enough uses for them (although each of my kds could probably eat an entire flat in one sitting…if I let them). This recipe looks great. I’ve never paired strawberries with pistachios. Can’t wait to try! Strawberries and pistachios are a great pairing and this is the perfect dessert to welcome spring. Yum! Looking forward to meeting you this weekend! Love this flavor combination and what beautiful photos. If it weren’t 9:15p and if I only had strawberries…I might be in the kitchen now. Oh happy strawberries!! I’d like to raid your fridge. That’s for the lingo clarification – all of them sound good!